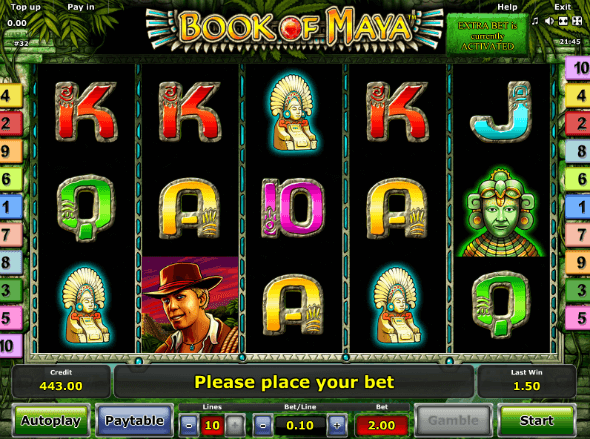 Released in the second part of 2015, Book of Maya slot appears to be a sequel of Novomatic’s flagship Book of Ra Deluxe, with the two games featuring the same main character and very similar visual appearance. Unfortunately, it seems that time has stopped in Novomatic world and despite being a relatively new game (launched over a decade after the original Book of Ra), Book of Maya slot feels a bit outdated. The Extra Bet is pretty much the only new feature, but as you will see below, we are not really sure it’s worth the money. All in all, the original game seems to be a better choice, but read further and see for yourself. The Novomatic slot is played at five reels and mere ten paylines, and while 10-coin default wager sounds good, getting winning combination on just ten lines will not be an easy task. You can choose anywhere from 1 to 10 paylines, but if you press the + button after reaching 10, the Extra Bet will be activated, doubling your total bet. With that in mind, we cannot recommend playing with Extra Bet on, since this feature only helps activate respins during the Free Spins feature, and as such, is definitely not worth the extra cost. Seeing that bet per line ranges from $0.04 to $5, you can stake anywhere from $0.04 to $100 per single spin. 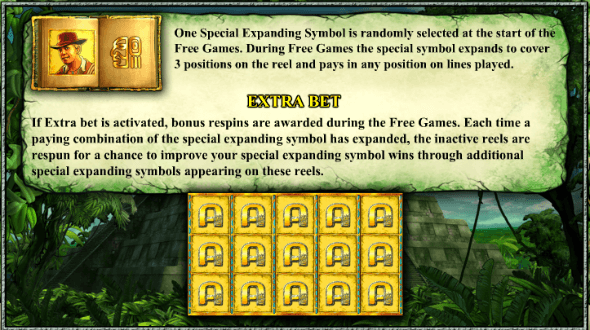 The Book of Maya symbol acts as both Wild and Scatter, replacing all other game icons to complete wins where possible, while also triggering the main bonus round when three or more are found anywhere on the reels. A total of 10 free games will be played, where one icon is randomly selected to act as a Special Expanding Symbol during the feature. If Extra Bet was active when the Free Spins round was won, you will also be awarded bonus respins. Gamble option can also be used after any winning spin. We really don’t see how Book of Maya is going to appeal to casino gamers. To say it correctly: we are not if anyone would prefer this game over the original classic slot. The visuals are pretty disappointing, there are no lucrative bonus rounds and the Extra Bet feature is only there to seriously lower the overall value.